Air travel challenges our bodies in a way that has never before been encountered in our evolutionary history. It allows us to move rapidly across multiple timezones, quicker than we could have ever moved by foot or animal. Unfortunately, our bodies are unable to adjust quickly enough. We are constrained by our circadian clocks, the things that give our bodies a sense of internal time, which have evolved to coordinate our physiology to the rhythmic and predictable changes in the external environment (as well as other roles) like day and night. The clock keeps its original time when you move timezones like a watch before you’ve reset it. It’s resistant to rapid change, giving us jet lag. However, unlike a watch, the body clock can gradually reset itself over a period of days so that we become tuned to a new local time. Despite this inbuilt mechanism, in an era of global travel it is often too slow. Is it possible to speed up the resetting process? Can we travel the world without jetlag? In order to see how we need to have a very good understanding of how the circadian clock links with the external environment. More specifically, we need to know how it responds when the external environment changes. Let’s go back to the watch setting metaphor. You turn a dial to set a watch. Turning this dial moves the hour and minute hands to the new time, with the amount you turn the dial corresponding to the amount the hands move. If you need to move the hands a lot, you turn the dial a lot. Now, imagine if the hour and minute hands move further when you turn the dial at one time of day and don’t turn at all at another time of day, no matter how hard you try with the dial. This, in effect, is how the circadian clock works – the amount the clock is able to shift is dependent on the time of day. The relationship between the timing of the treatment and the shift it evokes is called a phase response curve (PRC), and it is important in working out how to deal with changes in time zone. Because of this property of the clock, it is possible that treatments that are supposed to help readjustment actually have no effect, or worse, do the opposite of what you need to happen. It is all about the timing. What does this mean for treating or easing jet lag? Well, simply going outside, exercising, eating or taking medication during your new daytime is not the most efficient way to shift your body’s clock. In some cases could actually slow down your adjustment. The new schedule of light and dark at the destination will affect the circadian clock dramatically but because of the phase response curve, the effect of seeing light at 8am is very different to seeing light at midnight. It also means that, theoretically, it should be possible to design a programme to achieve the quickest adjustment and limit the negative impact of jet lag. Unfortunately, phase response curves can be different in different people (and organisms), which might be one of the reasons why a cure-all hasn’t been found yet. But let’s look at an example to help. Joanne flies from Mozambique, GMT +02:00, to Australia, GMT +10:00. Her internal clock carries on as if it never left Mozambique, staying on Mozambican time. She is not happy because she can’t get to sleep when nighttime arrives in Australia. Joanne is taking a trip from Mozambique to eastern Australia, a timezone shift of +8 hours from GMT +02:00 to GMT +10:00. When she arrives in Australia, her body thinks it is 08:00 (Joanne’s internal time, JIT) when in fact it is 16:00 (Australian Eastern Standard Time, AEST). By the time it is time to get ready for bed at 22:00 AEST, her body only thinks it is 14:00 JIT. She faces a long struggle to get to sleep as her clock will be keeping her awake. Joanne needs to ‘phase advance’ her body clock, to shift her clock forward, to come into line with Australian day and night. The strongest signal that affects the timing of the clock is light and so we will look at the PRC for light. Advancing the clock requires light exposure during the body’s early morning, from about 05:00 to 10:00 JIT. Joanne’s internal 05:00 – 10:00 period will happen during the day in Australia at 13:00 to 18:00 AEST, perfect for advancing her clock and getting sleepy earlier. 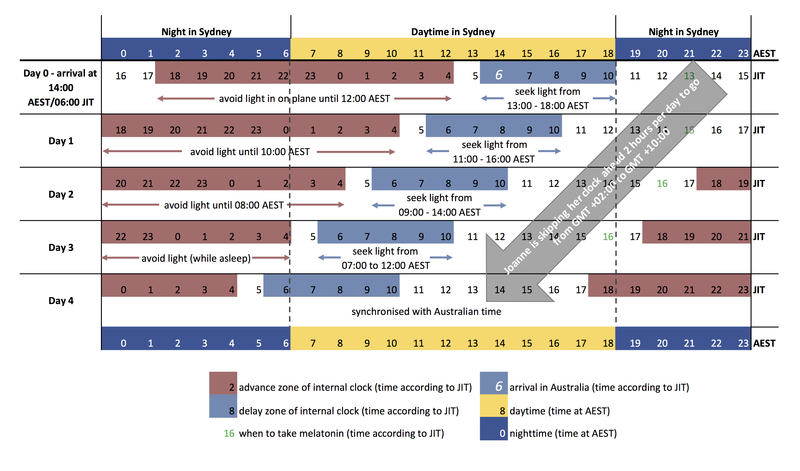 The problem is that part of her delay zone (approximately 00:00 to 04:00 JIT) will also occur during the Australian daytime (06:00-10:00 AEST) on the first day in Australia, meaning that if she is exposed to light in this period, which is likely, she will delay her clock, delaying sleepiness and counteracting the effect of “early morning” light. Luckily, she can rely on the fact that her clock will be telling her it’s sleep time, so it is possible that she won’t be up and around for much of the first Australian morning. A diagram explains this better, starting when Joanne arrives in Australia and predicting day-by-day how much her clock will shift (approximately, according to the human PRC) with a perfect schedule of seeking morning light and avoiding evening light. Flying eastward from Africa to Sydney. Seeking light in her internal morning and avoiding light in her internal night will help her skip the clock forward 2 hours per day. Seeking bright light at the right time should be easy as it always occurs during the Australian daytime. She’ll have to be careful to avoid bright light on the plane (day 0) and on the first morning in Australia (day 1) until 10:00. She could also use melatonin in this schedule, which she would need to take just before bed. This might help her readjust in two or three days instead of the four shown here. It would take 4 days to shift the 8 hours to Australian time. In reality, Joanne may feel fine sooner than this because of her Mozambican lifestyle shifting her to a more morning type – she normally goes to sleep by 20:00, which would mean she would be sleepy at the right time on day 3. Coming back is a little more simple, though Joanne will be waking up too early. On the first day, when Joanne’s body clock is saying, “Get up!”, it will be midnight in Mozambique. Joanne needs delay her clock by avoiding light in the advance zone and seeking light in the delay zone. Flying westward from Sydney to Mozambique. Joanne needs to delay her clock so that she sleeps later and later each day. Seeking light in her internal evening and avoiding light in her internal morning will help her delay the clock two hours per day. It is not possible to fit in melatonin on this schedule because she would need to take it in the middle of her sleep for it to have the right effect. 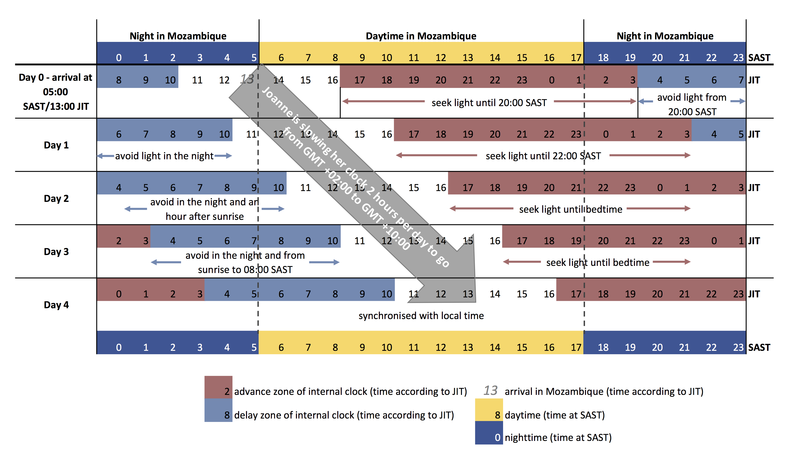 Both these requirements should be simple: her delay zone lines up with Mozambican afternoon and her advance zone coincides with Mozambican night. The problems could arise if she’s awake in the Mozambican night because her body is telling her it’s daytime. In this case, she should try not to expose herself to bright light e.g. by turning on lights or playing on the computer, because that would slow the shifting of her internal day. It’s not fun being awake when you’re supposed to be sleeping though, so, if she is bored, she should only use very dim light. Very dim red light and no blue light is the most optimum combination, because these correspond to the wavelengths to which the eye is least sensitive and most sensitive respectively for entraining the circadian clock. Programmes such as f.lux, Twilight, and Night Shift could help, as they put a filter on screens to reduce bright blue light. Another option would be to begin shifting before she departs – this wouldn’t speed up the overall time it takes to shift but would help her reach destination timing sooner after landing. This would need careful planning as she may have to alter her lifestyle quite a lot – for example being really careful to avoid bright light in the evening in Mozambique before her flight to Australia. Even with this schedule, it takes a few days to adjust. Is there anything else that could be done? While not licensed in the UK for the treatment of jet lag, melatonin could help. Melatonin is a hormone produced in the brain and synchronises circadian clocks in cells and tissues throughout the body. Like light, melatonin can shift the clock and has a phase response curve when given as a drug (at doses between 0.5 mg to 5 mg) that is roughly opposite that of light. Melatonin advances the clock between 13:00 and 01:00 with a peak response at 16:00, and delays the clock between 03:00 and 12:00 with a peak response at 10:00. When given alone, melatonin is no more effective than bright light, but combined light and melatonin treatments result in larger shifts than either treatment alone and effects which are roughly additive. For example, if on day 1 Joanne seeks light between 13:00 and 16:00 AEST and takes melatonin at midnight, and continues this combination as she shifts, she might be able to fully reset in 2 or 3 days. Taking it so late into the night (at the peak response) is quite inconvenient, but a compromise can be reached which takes into account the fact that melatonin causes drowsiness (and is a licensed to treat insomnia). Joanne could instead take it at 21:00 AEST, still in the advance zone, but also taking advantage of the drowsiness it causes to get to sleep. Unfortunately, melatonin may have some negative side-effects, especially in people with epilepsy and diabetes and also possibly interacts with the blood thinner warfarin, so requires further testing before it could be licensed as a common-use jet lag remedy. Another possibility is through scheduling meal times. Food is a strong timing cue within the body, especially for peripheral tissues like the liver, and ties into the close relationship between cellular metabolism and the circadian clock. It’s a natural timing cue as humans tend to eat during the day and not at nighttime. Food restriction diets are able to rapidly reset the circadian clock, and in one study in mice, a time-restricted diet was able to shift the clock in the liver by 10 hours in 2 days. It seems like a miracle cure, a kryptonite as one site calls it, and “Food eases jetlag” is an appealing headline e.g. New Scientist, Live Science because it seems so simple (unfortunately these headlines often take an interesting result, in this case that there is evidence for a separate brain region that controls food-entrained circadian rhythms, and spin it to the most general conclusion). Diet plans have been developed which tie in to this evidence in an attempt to speed up the resetting of the clock. One method involves alternating feeding-fasting cycles in the week before travel before a long fast on the travel day, only eating again at destination breakfast time. A simpler method involves fasting for 12-16 hours on the day of travel and having breakfast on arrival. You can even use a calculator to work out your own schedule – for Joanne, she would need to stop eating at 10:30 SAST on the day of her flight from Johannesburg, and eat again at breakfast time in Australia, 08:30 AEST (12:30 am SAST), when she’ll still be on the plane. Westward, she should fast from 02:30 AEST to 08:30 SAST (16:30 AEST), a few hours after she has landed. Unfortunately, whilst there are plenty of nice anecdotes, there is very little strong scientific evidence. Only one controlled study on the feasting-fasting diet has shown any effect. It’s a little cliche but more research is needed on all of these treatments. Controlled studies on humans in real conditions are required to tease apart how the clock responds to air travel across timezones and what effect treatments have in real life. Can a perfect light schedule really shift you in 4 days? Could a light schedule be designed that would actively disrupt this shifting, by seeking light at all the wrong times? Does melatonin really help, at what dose and time, and is it possible to avoid the side effects? And is feeding-fasting a kryptonite that can eliminate jet lag or is it just one aspect in an overall programme to help with circadian readjustment? My feeling is that these treatments will form part of an overall programme. I don’t believe there will be a single kryptonite method. The mechanism of the circadian clock is just far too robust to be reset instantly. After all, it is a mechanism that has evolved in plants and animals for millions of years, is tied into almost every physiological process, and works at the same rate despite temperature changes (a property called temperature compensation) unlike most other biological processes. It is resistant. My advice to Joanne is to follow the light schedule, which has the strongest evidence behind it, perhaps try the fasting diet, and above all be patient. It may take a few days but the body will adjust eventually. Oh, and don’t wake me up when you’re sitting there at 2am wide awake. My circadian rhythm is just fine thanks. If you’re interested in calculating your own light schedule (with and without melatonin) for any long haul flight, try the jet lag calculator at Jet Lag Rooster. There is evidence that the schedules that calculator generates work – one report of a significant negative correlation between following of schedule and severity of symptoms in twenty participants. A small sample, but it’s something! p.s. Animals also get jet lag. This is easy to investigate – you just change the light cycle in the house they are living in. Sadly there was once a researcher who didn’t realise this and flew his animals from Germany to US. I imagine his grant agency would’ve been less than impressed when they realised this mistake! This is super interesting! I’ll pass it on to all my frequent traveller colleagues. But, when I get confused about whether I’m supposed to be finding light or not at 3am I might need to wake you up to remind me.